Cruise ships up to 150m can lock-in to the inner harbor, where they moor to a quay alongside the walls of the old town. Two larger vessels up to 240m can tie up to four mooring buoys. Transfer by tender takes about 10 minutes. Taxis, shuttle service, tourist information, toilets, post-office, restaurant/bar and shops are available. This charming town on the coast of Brittany was originally a monastic settlement, but achieved fame in the 16th century as the home of a fierce breed of pirate-mariners, the Corsairs of Saint-Malo, who are often credited with the discovery of Canada and the Falkland Islands. Worth exploring are La Ville Intra-Muros-"the walled city"-which is best viewed when sailing into port early in the morning. You can climb up the 20-foot thick city walls and walk around them for a full mile.the Chateau of Saint-Malo, and the Cathedral of St. Vincent. St Malo has several museums reflecting the distinctive history and culture of Brittany. 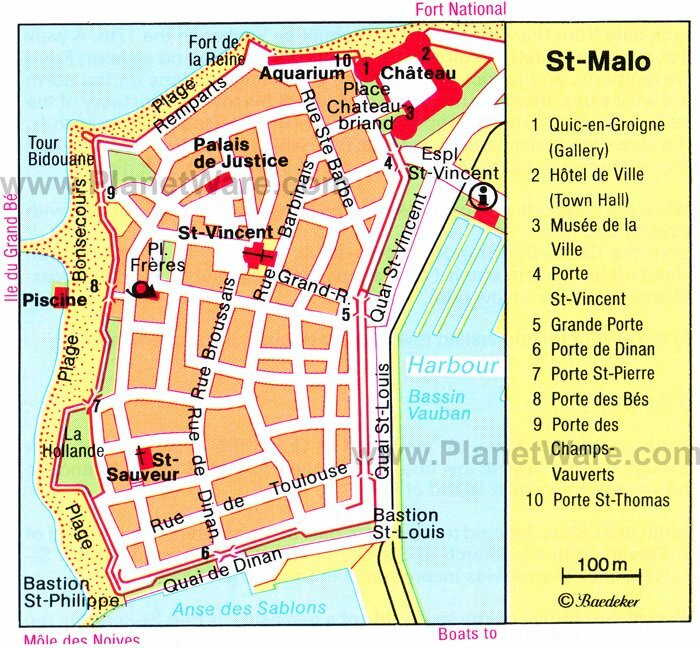 St. Malo is full of examples of beautiful buildings and attractions that depict a rich historical tapestry, including the magnificent Cathedral, the City History Wax Museums, the Old Market Hall, St Sauveur Chapel, the House of the Duchess Anne and the ancient street of Pelicot, with its timber houses. The tides here are huge: the difference between low tide and high tide can be 14 meters. The spectacular monastery, Le Mont St Michel, is built on a semi-island and is often cut off at high tide. It maybe difficult to find a taxi to take you there. The nearby mussel and oyster farms welcome visitors. At low tide it is possible to access the isle of Grand Bé, where the romantic French writer Chateaubriand is buried. The Alet peninsula offers an overhanging panoramic view on the Bay of St Malo, which is also the perfect gateway to explore further the delights of Western France. Roam along the tiny cobbled ancient streets, enjoy the fascinating shops full of local crafts, browse the open markets or try some of the great seafood restaurants, bars and boutiques. St Malo offers a host of delicious recipes, from the traditional meal of pancakes and cider to prestigious gourmet feasts. There is also a huge supermarket, just outside the city. For Internet check with the local tourist office at the Esplanade Saint-Vincent.